City Heights and National City are diverse, low income communities in the San Diego/Tijuana region of Southern California, with residents that include refugees and immigrants from over 60 countries. It is a region that is facing the impacts of climate change, including wildfires, heat waves, and water issues, and in some communities, air pollution and higher asthma rates. The Environmental Health Coalition (EHC) works in the region to address environmental justice issues, and partnered with La Maestra Community Health Centers on a Creating a Climate for Health pilot project funded by the Public Health Institute. 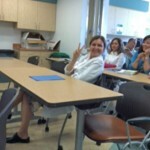 EHC built upon its “deep energy education” model to train La Maestra clinic staff and Promotores about the connections between climate change and health. 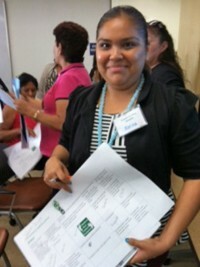 EHC provided materials to help Promotores and staff communicate with patients about the connections, and it laid the groundwork to link both clinic personnel and patients/community members to opportunities to influence and advocate for San Diego’s Climate Mitigation and Adaptation Plan (CMAP). The EHC “deep education” approach starts by working from the concerns immediately relevant to community members, and showing how their actions make a difference for their families while also making a difference for the planet. In the case of energy, for example, Promotores showed families how they could save money by reducing their energy usage, teaching them to track kilowatts, turn lights off and change out light bulbs. Families saw immediate savings, while also knowing they were reducing the greenhouse gas emissions that cause “calentamiento global” [global warming]. In communities already grappling with high rates of asthma and periods of extreme heat, the connection between climate change and health has been easy to draw. At this southernmost border of California, climate change is already regularly producing record-breaking heat waves, bigger and more frequent wildfires, worsening air quality, and threatens water supplies and food prices. “We start with questions like, “How many of you kept your kids out of school due to wildfires this week?” explains Ayala. EHC trained 40 La Maestra Promotores and over 30 physicians and developed accessible, bilingual, engagingly-illustrated educational materials for patients, focusing on sources of air pollution, the impacts on health, and the “invisible threat” of climate change. Materials highlighted actions individuals and families could take in the home to address climate change, and in their community such as engaging with the CMAP process. The clinic has also committed to adding two questions about climate change to their intake forms: 1) Do you have air conditioning? 2) Do you live near a “Cool Island”? 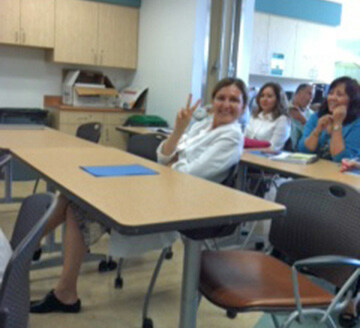 When the climate plan faced delays, EHC and La Maestra took the opportunity to conduct deeper and more specialized training with medical directors, nurses and medical staff, preparing lead medical staff to deliver key messages about the importance of the CMAP to government officials. Says Ayala, “Community testimony is more powerful if we’re also there with doctors.” Forty Promotores and six physicians signed EHC’s CMAP petition. Through a combination of direct outreach, in-clinic patient education and materials, and online outreach, over 11,000 La Maestra patients and EHC community residents will have learned about how they can take action to protect their health from climate change; and engagement with the CMAP process continues. EHC and La Maestra have developed a powerful community and health center partnership to weigh in on the climate change that is already directly touching families’ lives in these communities.